Hekasoft Backup & Restore - backup/restore major browsers data. Hekasoft Backup & Restore - backup and restore the data for major web browsers. 100% Freeware, FREE download v0.8 for Microsoft® Windows®, 3.58 MB. Hekasoft Backup & Restore is used to backup and restore the data of web browsers. Simple features but can backup the data of all major web browsers, you don't need to prepare special software for every web browser, so it is quite convenient. 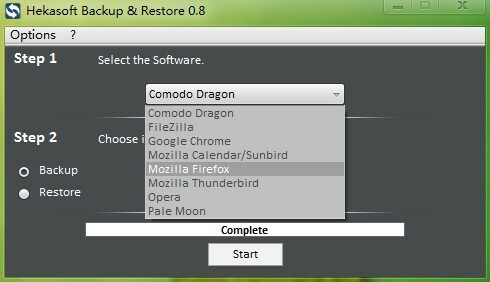 It also provides you with the backup feature for FileZilla and Mozilla Calendar/Sunbird. Hekasoft Backup & Restore supports to backup the data of the following software, and can backup all data of them, contains add-ons, bookmarks, settings, and so on. Please note that you should close the following target software to do backup. P.S. Now most web browsers have the data synchronization feature, but if you want to backup their data to local disk, this freeware is a good choice. Now the official installer is bad (May 07, 2012), but I have saved an available version for you, just download from this page.